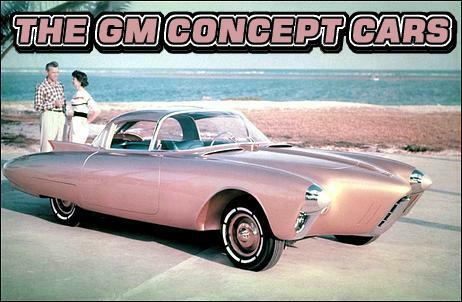 Sixty-two years of General Motors concept cars - from the weird to the weirder! The 1938 Buick Y-Job is generally considered the industry's first concept car. 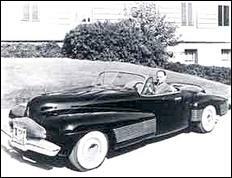 Created by General Motors Styling and Buick Engineering, it was designed by Harley J. Earl, GM's first design chief, and built on a production Buick chassis modified by Charlie Chayne, then Buick's chief engineer. 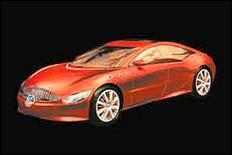 Buick called it "Y" because so many makers dubbed experimental cars "X." Styling and mechanical features of the "Y Job" showed up on GM products, particularly Buick and Cadillac, throughout the '40s. 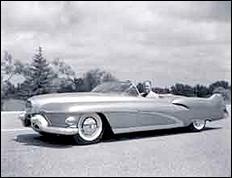 One of the most famous concept cars was the 1951 Buick LeSabre. Designed by Harley J. Earl's studio with styling cues from jet fighter planes and used by him for years as an everyday driver(! 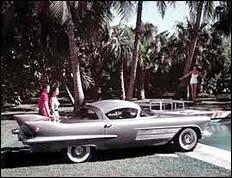 ), the LeSabre offered a preview of the aircraft styling that followed in the '50s. The '51 LeSabre contained such technological features as a dual gasoline and alcohol fuel system and a moisture sensor which would raise the convertible top if it began raining when the owner was away from the car. 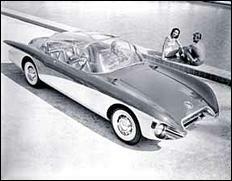 In support of GM Research's experimental turbine engine program, GM Styling in 1952 developed a needle-nosed, delta-winged vehicle, the Firebird I, (top) powered by a turbine engine. 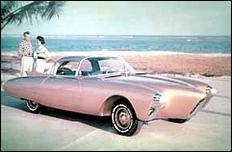 The fibreglass-reinforced plastic body was designed by Harley J. Earl. 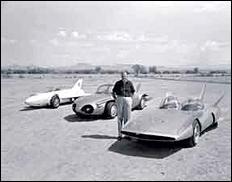 Four years later in 1956, a more refined four-passenger Firebird II turbine-powered car, which featured the first regenerative gas turbine, was introduced (centre). This technology allowed Firebird II to efficiently power accessories such as air conditioning and power steering. Firebird III (bottom) was built in 1958. A two-passenger, gas turbine-powered car, it was the first to feature a single stick control system which replaced the conventional steering wheel, brake pedal and accelerator. This drive- by-wire system was used in the first experiments with automated highways. 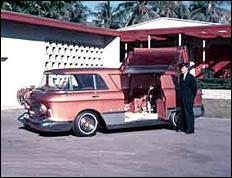 The GMC L'Universelle concept truck was unveiled in 1955 to show forward thinking in the area of delivery vehicles. The futuristic styling of L'Universelle influenced design in the '60s with the first compact passenger van from Chevrolet, which was built on a Corvair chassis. 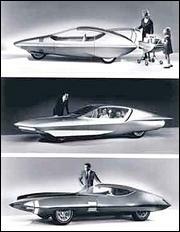 The experimental small commuter car Runabout was unveiled at GM's Futurama at the New York World's Fair in 1964. 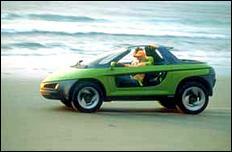 A three-wheel hatchback, Runabout carried two passengers and had ample storage room. 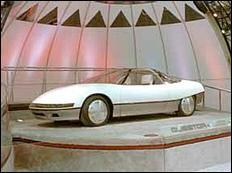 Also on display at Futurama was the Firebird IV, another sleek, turbine-powered car with strong aircraft styling cues. 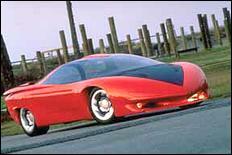 The GM-X Stiletto was an advanced, high-performance car with styling strongly influenced by aerospace design. It featured aircraft-type steering, a maintenance monitoring system with toggle switch controls, and a three-way speaker system for inside/ outside communications. 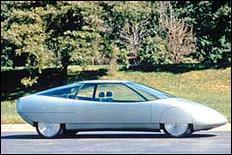 It also debuted at the 1964 New York World's Fair. 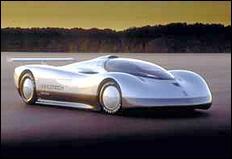 The 1988 Oldsmobile Aerotech, an experimental high-speed vehicle incorporating the latest in performance technology, was driven by three-time Indy 500 winner A.J. Foyt to a world closed-course speed record of 257mph (413 km/h). 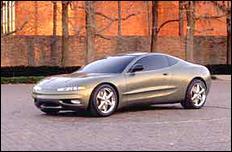 The 2000 Oldsmobile Profile concept is new kind of sophisticated sports sedan with power sliding rear doors, sliding fold-flat split rear seats and comprehensive mobile communications. Driving control is reinforced by a supercharged all-aluminum twin cam V6, all-wheel drive and Oldsmobile's Precision Control System. 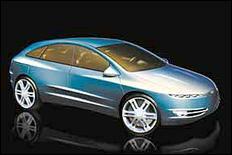 The 2000 Buick LaCrosse concept is an innovative and stylish luxury sedan crossover with versatility - it's quickly converted to a carrier of oversized cargo when panels open to reveal its pickup-type bed. The interior showcases consumer-friendly advanced technology such as voice-activated controls and reconfigurable colour head-up displays for driver and front passenger.